With data becoming the new cyber currency and data-gathering activities accelerating, companies are expected to demonstrate a commitment to accountability, lawfulness, transparency, and data protection. The rising tide of regulatory compliance and expansion of data across the extended enterprise requires organizations to re-engineer their business practices, redesign their data privacy policies and practices, and rearchitect their applications and backend infrastructure. CohnReznick takes a strategic approach to helping organizations implement a comprehensive data privacy program. 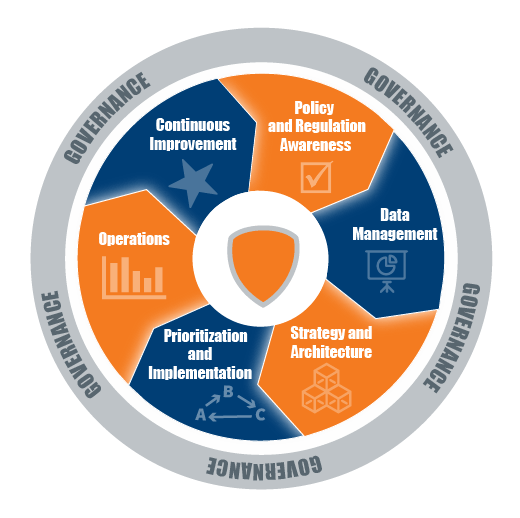 Using a proven data privacy framework, we help organizations establish an effective governance structure, improve policies and regulatory awareness, enhance data management practices, and devise a robust privacy strategy and roadmap. A holistic privacy management program can give organizations a differentiating, competitive advantage. CohnReznick helps organizations assess the validity of the mechanisms and resources in place to manage privacy within the organization. We do this by helping identify applicable laws, regulations, and gaps. CohnReznick helps companies with the complete data governance lifecycle by conducting a comprehensive and accurate inventory of its data assets with appropriate classification, determining the different levels of access, implementing protection mechanisms, documenting retention requirements, and establishing secure disposal practices of the data and the assets across the organization’s environment. We help design an applicable privacy roadmap tailored to the company’s ecosystem to make certain the organization’s privacy strategy allows the company to continuously measure and improve operations and ensure continued adherence to changing privacy policies. It is imperative that the privacy strategy and architecture are well-defined and documented, and that policies, standards, and procedures are well-documented and communicated. CohnReznick helps companies develop privacy policies and procedures in alignment with privacy laws and regulations. Many principles affect the operationalizing of a comprehensive privacy program. CohnReznick helps companies monitor compliance according to internal and third-party privacy policies. We help put a process in place for how to respond to requests from individuals (rights of “to be informed,” “access,” “rectification,” “erasure,” “stop processing,” and “data portability”) and conduct privacy awareness campaigns and training. We help organizations ensure that privacy requirements are embedded in the organization’s information security policies and procedures, and that there is a process in place to respond to privacy-related data breaches. Our privacy lifecycle framework helps companies develop their privacy programs through six strategic phases. The Federal Trade Commission (FTC) has proposed changes to the cybersecurity and privacy rules under the Gramm-Leach-Bliley Act (GLBA) that will bring additional compliance mandates for financial institutions. Among today’s leading-edge technologies, none packs the disruptive potential of artificial intelligence (AI) and blockchain to transform business models and redefine the future of work. These are powerful forces that innovative leaders are embracing to buttress innovation, growth, and analytics. In 2018, California enacted the California Consumer Privacy Act (CCPA), a regulation designed to help protect personal data.